There are all kinds of blogs on the internet; cooking, traveling and etc, but how often do you see someone create a personal finance blog? Is it worth writing about money management tips? The truth of the matter is, there’s no better time than now to discuss about this topic. Let me share with you why I think this is a popular niche to get involved with. Everyone – the poor, the rich and people like me who live paycheck to paycheck – all of us face with moneymaking decisions every day. Don’t agree with me? Well, when was the last time you talk about buying a new car, saving for your wedding or paying for your medical insurance? Money is always a subject of our daily conversation (and sometimes, our frustration), whether we realized it or not. Hence, it has become part of our habits to find solutions to the problem. You’d be surprised how many people actually go online to search for these answers and I’ll prove that to you in just a bit. The modern human beings are capable of doing many great things, but there’s one thing that we failed miserably – managing our own cash flow. I am saying this from my own personal experience. For as long as I can remember, no one at school taught me how to manage my money, not even my parents. Everyone was so focused on education qualification and I actually believed that that was the only path to success. However, when I graduated with a huge student loan debt, I was all alone by myself. No one has prepared me for the ugly reality that I had to face. Why hasn’t the ‘more experienced’ people tell me what to do? That’s when I realized that there has never been a special class in the traditional curriculum that teaches their students about personal finance – not one in high school and shockingly, none throughout my 5 years in college, while I was accumulating debt for myself. Consequently, I joined the rest of the ‘lost people’ in search for money solutions online. Our problems with money come as we enter different life stages. In order to live a fulfilling lifestyle at any point in our timeline, we need to constantly keep track of how our money is coming in and where it is going out. Given our current (lack of) knowledge on personal finance, we probably need a lot of help on that. Just to prove my point, log onto any news site later and search for some money topics to read. You’ll find a wide array of issues that are happening in reality and solutions that are being provided to help other people. Here are some eye-grabbing topics that I found on Google News this morning which seems like the situations that we face everyday. What Does the American Dream Mean for Millennials? Many Women Will Be Single in Retirement. Are You Ready? Interesting, eh? Can you now see how money affects every stage of our lives? Can you imagine the consequences if people don’t take this matter seriously? 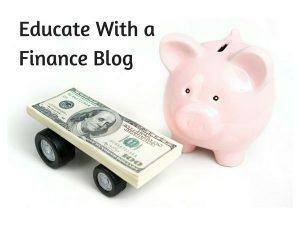 That’s something you can discuss about in your personal finance blog to raise more awareness. Remember when I said earlier that people are going online to search for answers to their money problem? Well, I didn’t make that up. I have numbers to show you that it is really happening. Jaaxy is a keyword tool that I used to search for interesting topics to write on my blog which is about starting an online business. There’s a metric called monthly searches that reflects the popularity of a keyphrase that people would type in the search engines. The bigger the number, the more demands there are for that particular query. 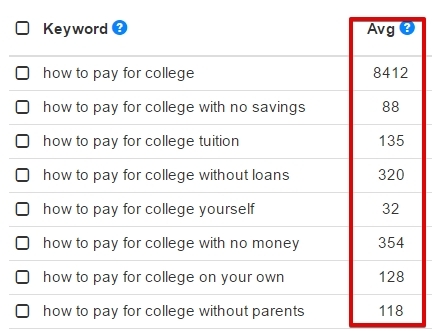 For example, there are more than 8000 queries for the term ‘how to pay for college” and if you add the other variations on the keyword list, you have close to 10, 000 (potential) college students looking for ways to finance their college fee – every single month. Multiply that by 12 months in a year and you got yourself a huge audience for just one niche! Now, with all these money talks, what can you gain as a blogger? Part of your solution would be to offer products/services that can help them with their money problems such as books, online courses or consultations. Having said that, you want to offer something that is legitimate, affordable and value-added for your audience. This creates trust and that’s what converts readers into customers for the long term. 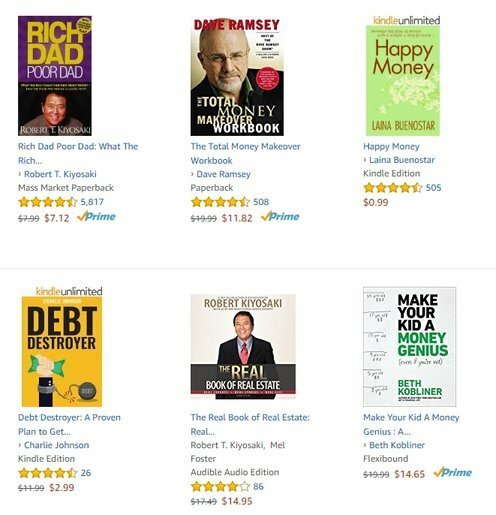 For example, a quick search on the Amazon online bookstore reveals thousands of resources that you can help people with their personal finance. When you promote any of these books on your blog, you’d get 4.5% in sales commission as an Amazon Associate. Alternatively, you can also share online programs that enable people to have more control over their money and careers by becoming online entrepreneurs. Wealthy Affiliate is a great platform that offer these services and for every membership you recommend, you could earn up to 49% in sales commissions through their own in-house affiliate program. What I mean is that, you don’t have to have a qualification in financial planning in order to be involved in this niche. It would be an added bonus if you do, but it’s certainly not a requirement. As long as you have some experience overcoming your own money problems, you can be a mother, a teacher or even a 20 year-old and still capable of creating a personal finance blog. To prove my point, here are some outstanding bloggers who didn’t start out as a money expert. Today, they have become very successful in helping people manage their money more wisely while running a profitable blog at the same time. If they can do it, so can you. Before I leave you to start your own blog, here’s one more thing that I want to share with you. Remember I said that there’s no better time to start than now? Look at the trend below and the year that we are in. HI Cathy, I think this would be a great niche and I agree, you don’t need to be a ‘money saving expert’. I mean what is that anyway? Someone could be very successful at this and all you’d need is experience of managing household finances. Something we all have right? You could write about how easy it is to get into debt and what you did to get out of, how to reduce your outgoings, increase your in-comings, how to get the best deals and etc. This would be fun niche to do. I love that idea and I wish our public education system would stop training out children as if we were still a country that actually manufactures products. I think it’s important for our kids to understand the possibilities and I LOVE this niche for online engagement and income. You bring up a lot of great points – whether it’s blogging, writing for Kindle or creating an online course – this is an outstanding way to step into the online business world. 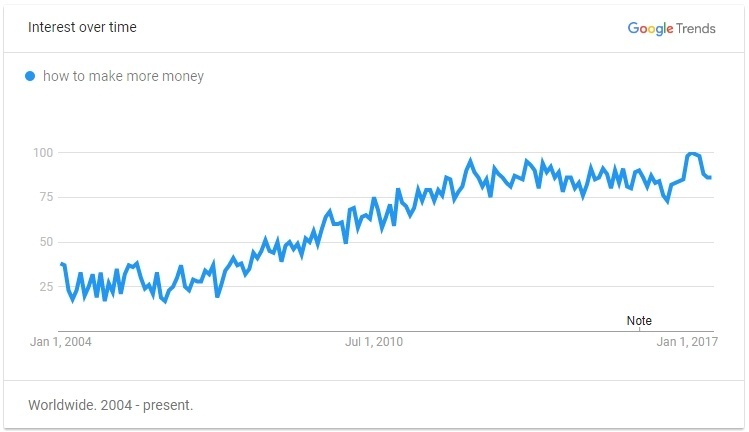 It seems that there’s a high demand for this sort of information, given how many millennials were sold on the idea of “piles of debt“, and now are in piles of debt (I’m one of them). Do you think it would be better to start a money blog that’s based on general information for everyone, or with a “personal experience” theme? Hi Bobby, I would go with the ‘personal experience’ theme such as college students struggling to pay their loans, young mothers on managing money matters or how retirees build online businesses to create a second income stream. This way, your audience would be more targeted, your topics are more relevant to one another and you have more advantages in becoming an authority within that particular niche. Hi Cathy, yes its kind of sad that they do not teach us in school when we are kids about how to generate money and wealth. It should be a top priority in high school and a required course, but unfortunately, a lot of us have to learn about it when we are older. The kids nowadays have such an advantage with the internet and what they can really do with it as far as generating income if they are just shown the way early on in life. What are your thoughts on that? Hi Mike, the internet has really taken down the barrier – techniques and cost wise – for setting up a blog or a business website. The rest is truly up to the creativity of the webmasters themselves, whether they just want to do it as a hobby or monetize from it. Generation Y is probably the trailblazers here, inspiring other age groups to do the same thing. Money is part of our everyday life but sadly, we don’t get taught about it at school, although things may have changed now. Living from week to week is the norm. I read a survey the other day, where the average American can only get $1000 if they need money quickly. What we need to do is save, and having a blog about money is a good idea since we are all involved in financial matters every day.